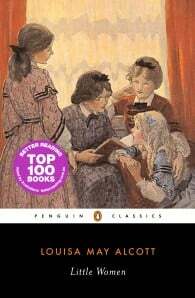 Louisa May Alcott was born in Germantown, Pennsylvania on November 29, 1832. She and her three sisters, Anna, Elizabeth, and May, were educated by their father, philosopher/ teacher Bronson Alcott, and raised on the practical Christianity of their mother, Abigail May. Louisa spent her childhood in Boston and in Concord, Massachusetts, where her days were enlightened by visits to Ralph Waldo Emerson’s library, excursions into nature with Henry David Thoreau, and theatricals in the barn at "Hillside" (now Hawthorne’s "Wayside"). Like her character, "Jo March" in Little Women, young Louisa was a tomboy. "No boy could be my friend till I had beaten him in a race," she claimed, "and no girl if she refused to climb trees, leap fences ..." For Louisa, writing was an early passion. She had a rich imagination and often her stories became melodramas that she and her sisters would act out for friends. Louisa preferred to play the "lurid" parts in these plays --"the villains, ghosts, bandits, and disdainful queens." At age 15, troubled by the poverty that plagued her family, she vowed: "I will do something by and by. Don’t care what, teach, sew, act, write, anything to help the family; and I’ll be rich and famous and happy before I die, see if I won’t!" Confronting a society that offered little opportunity to women seeking employment, Louisa determined, "... I will make a battering-ram of my head and make my way through this rough and tumble world." Whether as a teacher, seamstress, governess, or household servant, for many years Louisa did any work she could find. Louisa’s career as an author began with poetry and short stories that appeared in popular magazines. In 1854, when she was 22, her first book Flower Fables was published. A milestone along her literary path was Hospital Sketches (1863), based on the letters she had written home from her post as a nurse in Washington, DC during the Civil War. When Louisa was 35 years old, her publisher in Boston, Thomas Niles, asked her to write "a book for girls." Little Women was written at Orchard House from May to July 1868. The novel is based on Louisa and her sisters’ coming of age and is set in Civil War New England. "Jo March" was the first American juvenile heroine to act from her own individuality --a living, breathing person rather than the idealized stereotype then prevalent in children’s fiction. In all, Louisa published over 30 books and collections of stories. She died on March 6, 1888, only two days after her father, and is buried in Sleepy Hollow Cemetery in Concord.